Hello everyone! I’m back from Nationals feeling completely disappointed in myself, but I am ready to work hard and improve my game for the upcoming Yugioh season. While I was at Nationals I spoke with my good friend Scott Page on Thursday night about what decks we both expected to see at this event. 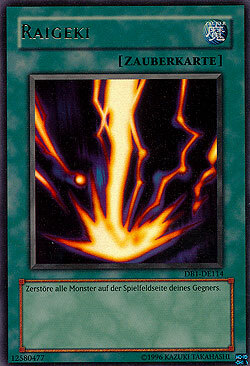 As we listed decks, Scott mentioned Ritual Beasts would be popular, as they are on Dueling Network. I was reluctant to believe this notion, but I remained open minded and sure enough multiple Ritual Beast decks topped this event. Not only that, a decent amount of the field at Nationals was actually Ritual Beasts! The biggest issue that people have with this deck is that they do not actually know what it does. Everyone knows the simplest thing, in that Ritual Beasts can only be special summoned once per turn. Outside of that fact, there seems to be a whole lot of confusion that this deck creates. When the Secret Forces first came out, many players splurged on box after box of this set in search for the powerful Nekroz cards. For every failed box there was probably enough cards to construct a Ritual Beast deck, which at the time wasn’t what people wanted. Players wanted to pull a Nekroz of Brionac, not a Pink Dolphin (Shoutout to Denny Yu)! The first weekend of The Secret Force’s release Nekroz dominated the playing field, but Ritual Beasts all managed to claim a few top spots and for good reason. When your opponent has to read every card you’re playing, you can very easily win due to his or her own ignorance. This became very apparent with Ritual Beasts. At the Columbus regional in February there was a Ritual Beast player that started 5-0, and Jeff and I were very skeptical because we both were sold on Nekroz. Jeff said that the guy was probably cheating his opponents and using the monster’s effects multiple times a turn, and I didn’t really know what to think so I remained silent. Jeff evidently was paired against this guy the following round, and sure enough the guy tried to cheat Jeff and special summon his Ritual Beast monster multiple times a turn! Luckily Jeff was quite aware of the capabilities of this Ritual Beast deck and he knew what to expect. Months after The Secret Forces release, a large sum of players are still struggling to understand just what Ritual Beasts do. I had a very miniscule understanding, which prompted me to contact my new friend Miguel Soto about Ritual Beasts. Miguel and I played at YCS Columbus and he was my only loss in swiss believe it or not! I got absolutely slaughtered by his Ritual Beast deck and I had no idea how to stop it. After the match he mentioned that I could have used Artifact Lancea and I kicked myself for not realizing that while I side decked. I wished him the best of luck as I was certain he would top that event. My first round on day two, I played against his friend playing the same deck. At that point I felt a bit more comfortable against the deck and managed to defeat my opponent. Fast forward to Nationals this year I ran into Miguel again and he was tearing up the swiss portion of the event with his favorite deck, Ritual Beasts! After seeing Miguel run through his opponent’s with the deck and make it all the way to Top four at Nationals I wanted to learn everything I could about Ritual Beasts and help the rest of the community better understand this deck. I asked Miguel quite a few questions and he responded with a very lengthy document of information to which I will relay to you all! What Exactly Are Ritual Beasts? Ritual Beasts are one of the most complicated decks in the current metagame because of the diverse amount of plays that can be made with the deck. Similar to Infernity, this deck special summons many times a turn and searches out trap cards that enhance the Ritual Beast player’s gamestate. 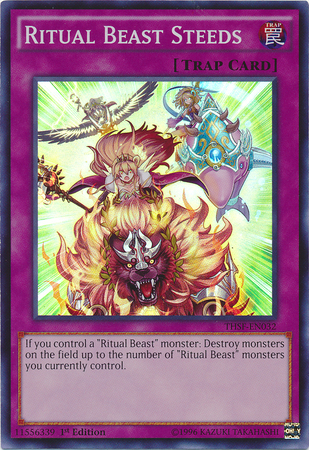 Much like a Gladiator Beast deck the Ritual Beast monsters contact fusion into the Ulti versions of themselves. In order for a Ritual Beast player to summon one of their fusion monsters they must have a Ritual Beast Tamer and a Ritual Beast monster. This is very important, as I’ve seen quite a few players play incorrectly against this deck. One particular mistake that I actually made while playing against Ritual Beasts was using my Artifact Lancea when my opponent had two Ritual Beast monsters on the field and no Tamers! Another important thing to remember that is extremely basic is that the Ritual Beast monsters do not have to be face-up on the field to contact fusion, which means that cards like Book of Moon or Book of Eclipse do not hinder this deck’s progression. Lets take a closer look at what this deck is actually searching shall we? As Ritual Beast players advance their gamestate they constantly acquire two particular trap cards from their deck, Ritual Beast Steeds and Ritual Beast Ambush. Much like Infernity Break, Ritual Beast Steeds destroys monsters on your opponent’s side of the field, but Steeds is much more devastating! Steeds will destroy monsters on your opponent’s side of the field equal to the number of Ritual Beast monster on your side of the field and this card’s effect does not target. Steeds is definitely one of the cards that will ruin your day if you aren’t aware of its existence. A very common way that Ritual Beast players abuse Steeds is by activating their Steeds and then chaining their Ulti monster’s effect to de-fuse back into the Ritual Beast monsters. This play will result in a Ritual Beast player destroying multiple monsters as opposed to just one. Ritual Beast Ambush is the Infernity Launcher of the deck. Ambush allows the Ritual Beast player to special summon one Ritual Beast Tamer and one Ritual Beast monster from their graveyard or their extra deck. A very common misconception surrounding Ambush is that people think that it has to summon from the graveyard and the banished pile, but Ambush actually allows you to special two from one place if you wanted to. Most players immediately pick up and read at least one of the many Ritual Beast monsters as the match progresses, which is definitely not ideal. Lets take a look at the many monsters in this deck and understand what they do, shall we? Ritual Beast Tamer Elder: Elder has one very simple effect in that it allows the controller to gain an additional normal summon, so long as it is expended on another Ritual Beast monster. Most Ritual Beast decks play three copies of Elder because they want to open up with him and combo off. Ritual Beast Tamer Wen: Wen allows the controller to special summon one of their banished Ritual Beast monsters when she is normal summoned. Wen is much better than her counterpart, Lara, because there’s a much higher chance that Ritual Beasts will be banished than in the graveyard. 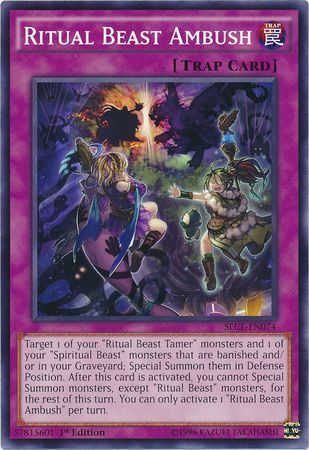 Ritual Beast Tamer Lara: When Lara is normal summoned she allows the controller to special summon one of the Ritual Beast monsters from the graveyard. Ritual Beast Tamer Pilica: Pilica has the exact same effect as Lara, except the monster that is summoned gets destroyed during the end phase. Miguel used one Lara and one Pilica because they both accomplish the same thing and it gives him more names to use while performing his combos. Spiritual Beast Cannahawk: Cannahawk is the card that really gets Ritual Beasts going because it can once per turn banish a Ritual Beast monster from the deck and grab it back in two turns. Cannahawk is integral to kicking starting any of the power plays because he gives you more names to combo with. Spiritual Beast Rampengu: Rampengu has an effect similar to that of Elemental Hero Prisma in that he takes a Ritual Beast monster from the extra deck, banishes it, and then sends a Ritual Beast monster with the same time as the banished monster’s from the deck to the graveyard. Spiritual Beast Apelio: Apelio is one of the most important Ritual Beast monsters because he allows you to boost your monster’s attack power by 500 points. Apelio is particularly strong because he can be used on either player’s turn, which is something a lot of players mistake. His effect also stacks for the turn it’s used, which means that if you used his effect, returned him to the field, and then used his effect again, your Ritual Beast monsters would all gain 1000 attack for the entire turn! Spiritual Beast Pettlephin: Pettlephin is the solution to floodgates and problem monsters for the Ritual Beast deck. By banishing a card from your hand you can return any card your opponent controls back to their hand! Ritual Beast Ulti-Cannahawk: Ulti-Cannahawk is the most important extra deck monster because he is the card that is constantly netting you free searches through his powerful effect. 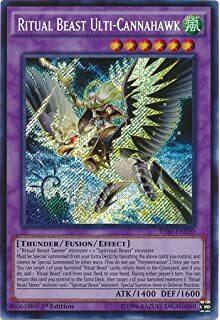 Ulti-Cannahawk is easily abused by activating his effect to send to Ritual Beast cards to the graveyard and the chaining his other effect to de-fuse and special summoning one of the two cards that were going to be returned. This play typically has player’s questioning whether or not it is in fact legal, I know I was skeptical the first time! Ritual Beast Ulti-Apelio: Ulti-Apelio is the Armades of the deck and what gives it such a good Nekroz match-up. Since Ulti-Apelio is unaffected by card effects when he attacks he can swing right through Nekroz of Valkyrus and do some massive damage. However it’s important to understand that he’s unaffected by all card effects during this time. This means that if you had used Apelio’s effect to boost all of your Ritual Beast monsters by 500 for the turn, the Ulti-Apelio would actually be unaffected by this lingering effect and remain at 2600! 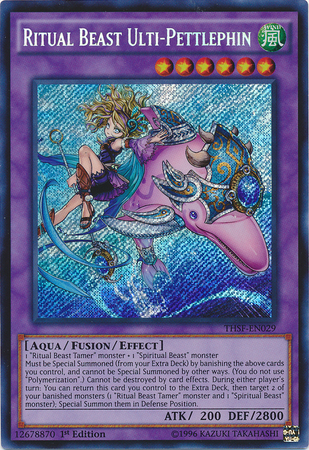 Ritual Beast Ulti-Pettlephin: Ulti-Pettlephin cannot be destroyed by card effects and has an incredibly high defense of 2800, which makes her a wall for the Ritual Beast deck. I had the pleasure of talking with Miguel Soto and having him explain some of the combos of the deck and where they should end you when you perform them. Miguel explained to me that there are four very optimal opening plays that Ritual Beasts have. Miguel says the most basic combo of the deck involves Elder and Cannahawk. Soto told me that Elder and Cannahawk would convert into two searches, which should always be a Steeds and an Ambush. It’s important to know that competent Ritual Beast players will always ensure that they end their turn with an Ambush at their disposal. This means that if they search two copies of Ritual Beast Steeds, you should be able to read that they have an Ambush already. The second optimal opening is Elder, Rampengu, and Dimensional Fissure because it allows you to search three cards and have Dimensional Fissure face-up on the field! Miguel says that after the Elder/Rampengu/Dimensional Fissure combo your ending field should be an Ulti-Cannahawk, Dimensional Fisure, Steeds, Ambush, and whatever card you choose to search third. The third and fourth ideal openings are Elder/Rampengu/Soul Charge and Elder/Cannahawk/Emergency Teleport, says Soto. According to Miguel, a lot of players struggle with uncovering the perfect sense of balance amongst the Tamers in Ritual Beast deck. Soto explained that while Wen is the strongest Tamer she is the worst in the early game, which is the most important portion of the game for a Ritual Beast player. Knowing this, Soto wanted to maximize cards that would enhance his early game, which lead him to the conclusion of running two copies of Lara and three copies of Elder. Ritual Beasts are not unbeatable, and a lot of players are already using the cards that put this deck out of its misery, it’s just a matter of knowing what is effective. “The biggest fear of a Ritual Beast player is the card Denko Sekka along with Maxx “C” and Artifact Lancea,” says Soto. Denko Sekka can outright win you the game against Ritual Beasts because they are so reliant on their plethora of backrow to score them the victory. The hand traps, Maxx “C” and Lancea, are the most effective against Ritual Beasts because there really isn’t a solid way of playing around these cards, whereas Denko can be halted by Solemn Warning and Chaos Trap Hole. Soto suggested using Debunk to counter these hand traps, and he also found it to be applicable when playing against Burning Abyss, Shaddoll, Nekroz, and the hands. Miguel mentioned that massive field removal is another great fear of his if he can’t easily replenish his field. Cards like Fire Lake, Dark Hole, Torrential Tribute, Raigeki, and Mirror Force are the best ways to stun a Ritual Beast player, explains Soto. The Circuit Series stops by Charlotte next, will you be prepared for Ritual Beasts? Will you pilot this intriguing deck and make a run for the top cut? I strongly encourage you to give this deck a try, as I enjoyed playing something different from Nekroz while I tested it out. I would like to extend a huge thank you to Miguel Soto for helping me better comprehend Ritual Beasts, and I wish him the best of luck at the World Championship in Kyoto! Until next time Duelists, Play Hard or Go Home! There’s just one problem with this article: The perfect ratio bit. I mean, sure, if you open Wen, it’s difficult. But say, you open a hand of Wen, Cannahawk/Rampengu+D-Fissure, and Ambush. That nets you a gain on turn 2. I just wanted to say that Ritual Beast Ambush’s effect given is incorrect. The author states that it summons from the grave or EXTRA DECK, which only half is true. Ambush summons from the BANISHED ZONE, not the Extra Deck. Hope he fixes that. -How do you think Decree would do? Pettlephin can out it as well as sided mst’s, so I’m not sure of its effectiveness. gaiapelio wins a game once you leave them summoning so much. decree and trap stun is a fine choice, tag it with effect veilers (i used up to 3) so that pettlephin cannot stop floodgates. I think Imperial Iron Wall is a good floodgate side, perhaps Poisonous Winds, although it doesn”t have the same general utility.